Village Signs is a series of caches based on the ornate signs that depict the heritage, history and culture of the villages that put them up*. 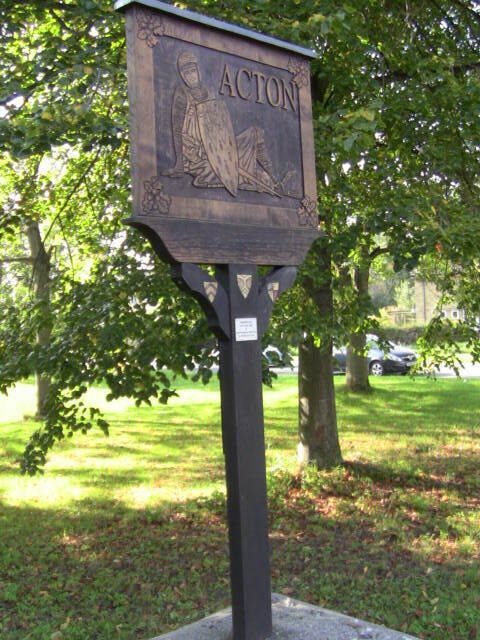 The Domesday Book records the population of Acton in 1086 to be 83. All Saints is the local church. There are five bells that hang in the church with the heaviest weighing 8-1-4 cwt. William Jennens was known as "William the Miser" and the "Acton Miser." Jennens made his money loaning money to gamblers and was Britain's richest man at the time of his death in 1798, but aged 97 he had outlived the nominated executors and beneficiaries under his will. According to the BBC QI series, Jennens vs Jennens commenced in 1798 and was abandoned in 1915 (117 years later) when the legal fees had exhausted the Jennens estate of funds (worth c. £2 million). The case of Jennens v Jennens formed part of the inspiration for the Jarndyce and Jarndyce case at the centre of the plot of Bleak House by Charles Dickens. Another Acton resident, Catherine Foster, was believed to be the last woman to be hanged at Bury St Edmunds, in 1847. At the age of 17 she poisoned her husband by putting arsenic in his dumplings. The propriety of this case was discussed in the House of Lords and reported in Hansard. You will be looking for a 35mm film canister. A=First number of date in June. B=Second number of date in June. C=Add First and Last numbers of Year together. D=Number of Oak leaves, plus Lions on shield, plus one. E= How many acorns in total on the Oak leaves minus Three. F=Second number of Year minus third number of the Year.